The sheet metal products used in Protean’s manufacturing operations are all 100% recyclable. All of the remaining waste in our sheet metal and aluminum extrusion production is recycled, resold as scrap to secondary recyclers to be processed as post industrial content. Total recycled content of 20% to 50%. Total recycled content of 22% to 26%. Stainless steel sheet is 75 to 80% post industrial recycled content. additional LEED® point under Credit 4.2. Secondary billet can be used for aluminum products. Typically, secondary billet recycled content will be approximately 60-80% postindustrial content. You can request documentation from your aluminum product manufacturer for the exact amount of recycled content. anodize color or gloss. Secondary billet is safe to use on aluminum that will receive a painted finish. construction site, especially for products shipped directly to jobsite (column covers, panels, trim). it may be possible to achieve credit for use of low-VOC materials under the Innovation in Design category. Trinar) can be applied using specialized equipment that captures and destroys VOC’s in the painting process, with 95%+ efficiency. Destroying the VOC's and not emitting them into the atmosphere prevents pollution and ozone depletion. Powder Paint Finishes - This option provides a VOC-free coating. Anodize Finishes - This option provides a VOC-free coating. Further information on the USGBC and LEED may be obtained at www.usgbc.org. 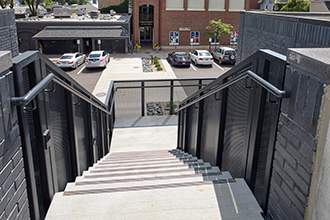 The Mill Street Parking Complex was designed for long life and street appeal in a mixed use, pedestrian-friendly downtown area. 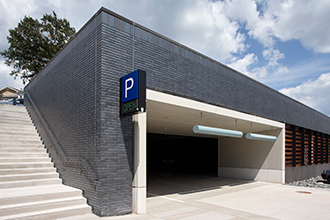 The 375-stall, 93,700 square-foot parking structure required durable construction and a breathable façade in the parking areas. To achieve this, the architect chose to use 0.125-inch thick material throughout the construction. The architect also specified a graduated hole size perforation. Protean used in-house capabilities to create this effect as the pattern was not available in the market. 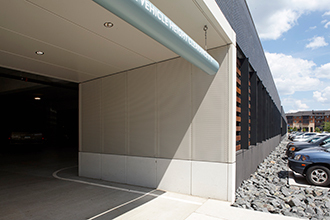 Protean’s AP-1125 aluminum plate panels met the design requirements and created an appealing blend of solid plate and perforated material.